(Bloomberg) – South Africa’s plan to spend more subsidising higher education is fiscally unsustainable and is unlikely to supply more skills to the economy, the World Bank said. The cost of post-school education and training will more than double to R172.2bn ($12bn) by 2022, or 2.5% of gross domestic product, from R65.4bn in 2017, the Washington-based lender said in an economic update on the country Tuesday. File Image: Jacob Zuma releases Heher report on tertiary education fees. 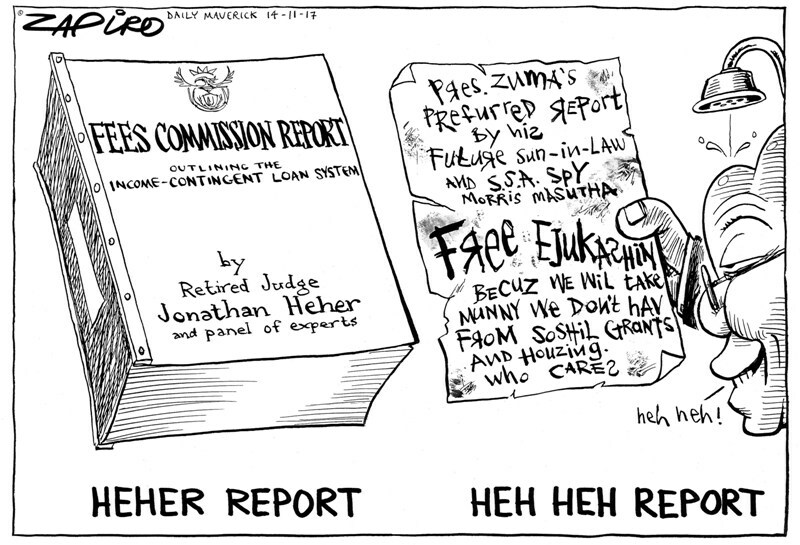 More of Zapiro’s magic available at www.zapiro.com. In December 2017, former President Jacob Zuma announced that tuition fees would be scrapped for students from homes with a combined annual income of 350,000 rand or less. A skills deficit is contributing to chronically high unemployment levels in country in South Africa, where the economy hasn’t grown by more than 2 percent a year since 2013. The program’s high cost would likely make the target of doubling enrolments by 2030 “elusive,” the lender said. “This would inevitably create frustration among youth who would be barred from entering institutions even though they would be academically eligible and qualify for financial support,” and employers wouldn’t be able to find the skills they need to stay competitive. Government debt is expected to stabilise later than forecast, and at a higher level, peaking at 59.6% of GDP in 2023-24, the National Treasury said in October. “In a fiscally constrained environment, it will be critical that the government’s higher-education policy does not impose unnecessary burdens on the national budget,” the World Bank said. On Jan. 9, the lender lowered South Africa’s economic-growth forecast to 0.9%from 1.4% for 2018 and expects GDP to expand 1.3% in 2019 and 1.7% in 2020. Tertiary education should centre on technical, vocational and lifelong training, and community colleges, which offer more flexibility, should receive the same level of attention for improvement as technical colleges, the World Bank said. Realising cost efficiencies in distance education and encouraging private-sector participation can also lessen the burden on public finances, it said. It recommended regulating tuition fees and that some grants be converted to income-contingent loans.